Time to see how the Millennium Falcon flies. I set up a battle between Han Solo and bunch of Scum & Villainy ships as a change from fighting Imperials. The Millennium Falcon is great because not only does it have a turret, allowing it to fire in all directions, but this is its primary weapon, which means it can get all the bonuses that regular primary weapons can get, such as an extra die for close range. This makes getting close to the Falcon extremely dangerous. Han is teamed with Biggs, not Luke. Biggs acts as a decoy. The Falcon is easy to hit, with only one defence die, so it has to rely on its shields and hull to survive while it peppers incoming ships with laser fire. I added the ‘Millennium Falcon’ title upgrade (otherwise you are flying some other random Corellian cruiser), and this grants it the evade ability. This gives you a guaranteed evade result which negates one damage from a hit. The other great thing about the Falcon is that it can carry two crew members, and these are what can make it into a powerhouse. I put Chewbacca and the wookie Gunner in these slots. The Falcon and its crew. Chewbacca keeps the ship flying, while Han and the wookie Gunner blast at anything in sight. Han gives you a re-roll, sort of a free target lock. Although you have to re-roll all your dice this is still a great ability. Then if you miss, the Gunner gives you a second shot! By then hopefully your opponent will have used up their focus or evade token and so you are even more likely to hit. And all of this can be used with the Falcon’s 360 degree turret, meaning that you are pretty much bound to hit something every turn. Biggs’ ability is ideal, although not so ideal for Biggs himself. 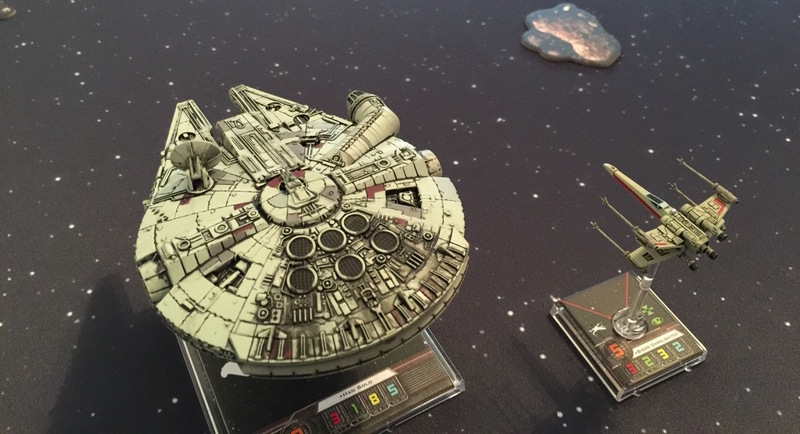 Opponents have to shoot at him if he is next to the Falcon. This makes him into another set of shields for the Falcon, giving Han even more time to shoot the enemy ships out of the sky. So who are the plucky bounty hunters who have decided that the reward is high enough to go up against this formidable pair? The bounty bunters. They don’t look so tough compared to the Falcon. The Scum & Villainy faction has pirate versions of some of the rebel ships, along with ships of their own. 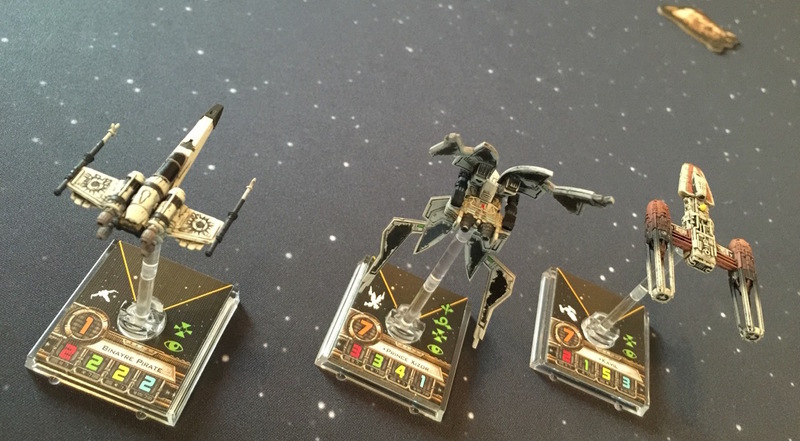 For this squad I chose Prince Xizor in his StarViper, flanked by a super-tough smuggler Y-Wing laden with missiles and bombs, and a nippy pirate Z-95. Both the StarViper and the Y-Wing are tough with decent firepower, so the strategy was to withstand the Falcon’s barrage long enough to take it out. There is no point trying to do any arc-dodging (i.e. manoeuvring to be outside the opponent’s forward arc of fire), so a fast strong attack seemed to be the way to go. So how did they do? I played two games. In the first game the pirates won. Xizor has a great ability to divert hits to a nearby friendly ship. Sort of the opposite of Biggs’ ability. This partially nullified the super attack combo of Han and the Gunner, meaning that the Falcon couldn’t manage to destroy the pirates fast enough while they whittled down its shields and hull. Han would hit with his first attack, but Xizor would then divert the damage to the Y-Wing. Since Han hit, the gunner didn’t get a second shot. The Y-Wing drops a proximity bomb directly in front of the Falcon. Ouch! The Falcon’s size made it hard to fly between the asteroids and so it occasionally lagged behind Biggs, allowing direct attacks, and this accelerated the attrition. Han won the second battle, learning from his mistakes in the first. The first change to Han’s strategy was to fly both ships slower, keeping Biggs in range. The second was to not attack Xizor until he was the last pirate standing. This way his damage-avoidance ability was wasted. The Y-Wing was the first to go. 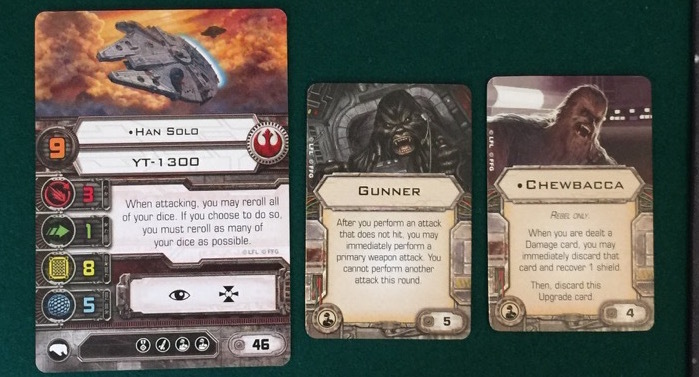 The third tactic was not to take a focus token as Han’s action, but to take an evade token instead. This reduced the Falcon’s firepower slightly, but the Han/Gunner combo is plenty powerful without even more re-rolls, and a guaranteed evade result means that even with only one lousy defence die it takes a long time to get through the Falcon’s shields. I do need to get better at flying these ships. Recently I have been including the asteroids and while this makes for a much more interesting game I keep smashing into them all the time, and flying the ships into each other. You aren’t allowed to put the manoeuvre templates down on the board to measure your moves. You have to plan everything by eye, and I keep being surprised by where the ships actually end up! I guess it’ll be a long time before I can swoop the Falcon through of the skeleton of a crashed star destroyer. 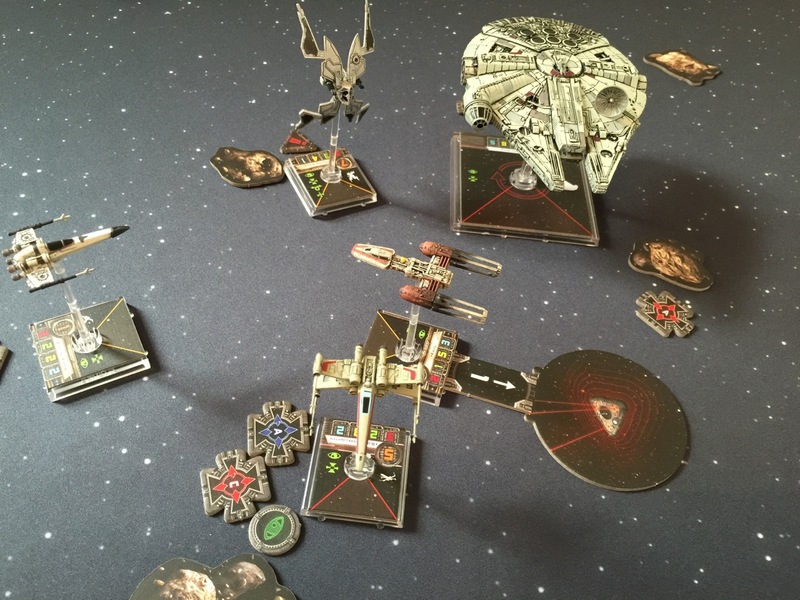 Posted in Blog Posts and tagged session report, X-Wing Miniatures Game on October 20, 2015 by Tim.